All shipping traffic to and from Esbjerg, which is among the largest commercial ports in Denmark, goes through the channels Grådyb and Grådyb Barre. A narrow and challenging area for navigation at low tidal conditions. All ships pass the Wadden Sea’s northern-most island Fanø. Off the island’s northern part Grønningen the channel is squeezed in between the sandbanks Sandende and Skallingen at the Blåvandshuk. Above: ASTOR off the vast Fanø west beach 04:50 from Sylt further south in The Wadden Sea, on route for Esbjerg. Right: ARK DANIA passes the Søren Jessens Sand. From the vast north-western beach at the Fanø Vesterhavbad and the Ringby Strand, the huge sandbank Søren Jessens Sand gives a spectacular dessert-like foreground for ships passing through Grådyb Channel. Finally Fanø eastern-most part Halen overlooks Port of Esbjerg, which in recent years has been expanded with new terminals towards south aimed for the offshore wind industry and now also comprising DFDS’ terminal for the daily Immingham freight route. DANA SIRENA passes the Grådyb Channel on its approach to Esbjerg from Harwich. The UNESCO World Heritage protected Wadden Sea stretching from Blåvandshuk in the southwestern part of Denmark southward along the German and Dutch North Sea coast down to Texel. The unique environment of the Wadden Sea provide an interesting setting for maritime photography. In several special “Wadden Sea entries”, I visit some of these locations, where commercial shipping interacts with this very distinct marine landscape – or maybe more accurate “seascapes”. NORRÖNA in backlight photographed from Nordby. “The word wad is Dutch for “mud flat” (Low German and German: Watt, Danish: Vade). The area is typified by extensive tidal mud flats, deeper tidal trenches (tidal creeks) and the islands that are contained within this, a region continually contested by land and sea. 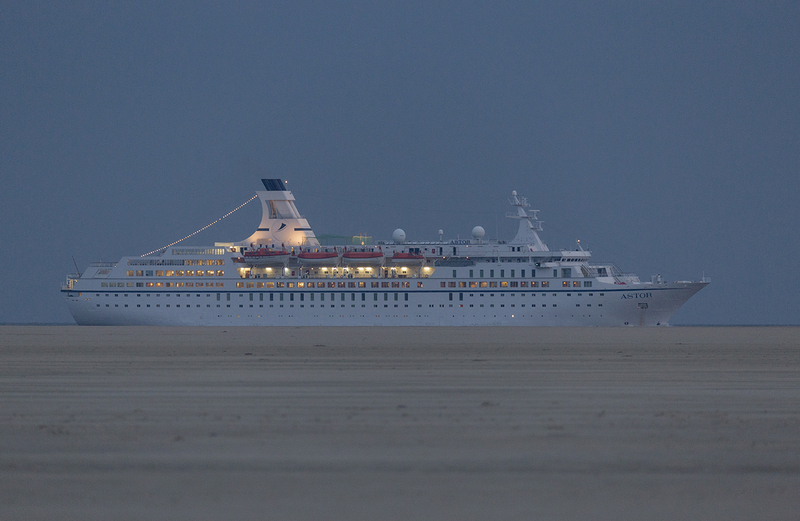 ASTOR off the vast Fanø west beach 04:50 from Sylt further south in The Wadden Sea, on route for Esbjerg.